For Q4 2017, we've analyzed over 240 million Google AdWords search ad impressions across 750+ unique accounts in USD currency to uncover the average CPM, CPC, and CTR. Compared to Q3'17, we found the average CPM on AdWords search ads decreased 30%, the average CPC on AdWords search ads decreased 42%, and the average CTR for AdWords search ads increased 21%. *Note: these benchmarks do not include ads run on Google Display Network or Youtube. Be sure to view the Q4 Paid Search and Paid Social ads Benchmark Report for the latest trends. Based on AdStage data, Google AdWords CPM decreased by 30% from $111.42 in Q3 to $78.47 in Q4. The 2017 trend shows that Google AdWords CPMs decreased 25% from $104.05 to $78.47 comparing Q1 to Q4. 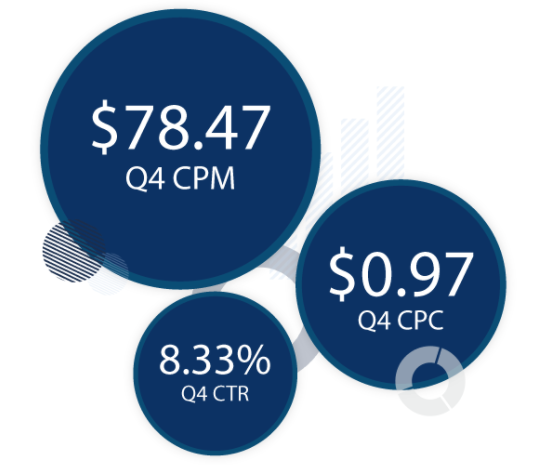 Based on AdStage data, Google AdWords CPC decreased by 42% from $1.68 in Q3 to $0.97 in Q4. The 2017 trend shows that Google AdWords CPCs decreased 29% from $1.37 to $0.97 comparing Q1 to Q4. Based on AdStage data, Google AdWords CTR decreased by 21% from 6.87% in Q3 to 8.33% in Q4. The 2017 trend shows that Google AdWords CPMs decreased 2% from 8.47% to 8.33% comparing Q1 to Q4. Across AdStage’s customer base, Google AdWords search spending increased by 146% year over year in Q4 2017 and by 9% QoQ. In addition, AdWords captured 91% of paid search budgets while Bing Ads earned the remaining 9% in Q4. This expansion will push Google’s share of the US digital ad market to 42.2%, according to eMarketer. That said, Google AdWords and Facebook ad budgets are truly a duopoly gobbling up more than 60% of US digital ad investment. Looking into 2018, these trends aren't slowing down as Google owns the #1 browser, search engine, email platform, and video network. As more performance marketers shift their focus and budgets into full lifecycle marketing rather than bottom of the funnel marketing, AdWords will continue to receive a lion's share of the digital ad budgets. JD is the Director of Growth Marketing at AdStage. He’s a savvy marketer, digital strategist, and avid cyclist. A stereotypical coffee snob and recovering Coloradan, he’s a creative thinker who sees the big picture but loves getting lost in the details.